With each day more people are turning to herbs and vitamin supplements to ease their pain and/or enhance their overall health. People are taking control over their own health and we're telling the medical profession that they are NOT the only answer. We are pressuring our doctors to become more enlightened and to educate themselves on natural alternatives. What Are Vitamins and When Should We Take Them? No person is too young or old to benefit from vitamins but whether there’s a need for taking vitamin supplements mostly depends on a persons health condition rather than his age. Vitamins are substances that can be found inside your body or in food. They can be water-soluble or fat-soluble. The latter type of vitamins can be stored inside your body; they will stay there until the body finds a use for them. Water-soluble vitamins on the other hand are eliminated through urination if the body has no need for them. Because of this, you should ensure that your body has a ready supply of water-vitamins prepared daily for any eventuality. What Functions Do Vitamins Perform? Vitamins help the body in various ways. Although specific vitamins play specific functions. Vitamin A is good for the eyes while vitamin K aids in blood clotting and vitamins in general strengthen the immune system, help body organs and cells perform their activities, and facilitate the growth and development of your health. These days, we all know that taking vitamins is an easy way to start pursuing a healthy and disease free way of life. In the past, vitamins were used with diets, although they weren’t near as sophisticated as they are today. The vitamins of today are far more sophisticated and geared towards certain aspects of your body and your health. Even though some people may not realize it, food doesn’t give you all of the vitamins and nutrients your body needs. Although you may be following a healthy diet, you won’t receive everything your body needs to carry out daily functions. You can buy high quality food if you wish, although it isn’t the preferred way to fix this type of situation. No matter what you choose to eat, you still won’t get the vitamins and nutrients you need. If you have any type of restrictions with your diet, it can be even more difficult to get the vitamins and nutrients you need. Those who suffer from food allergies especially, find it even harder to get the right amount of vitamins. Even if you have a small appetite, you can be at a major disadvantage to getting everything your body needs. Smaller appetites get full a lot quicker, making it harder to eat the foods you need on a daily basis. No matter how you look at it, you won’t get everything your body needs from food. 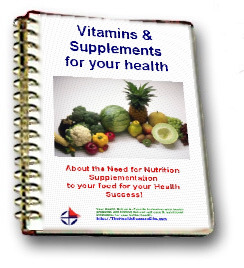 To get the vitamins, minerals, and nutrients you need, you’ll need to use supplements and vitamins. Vitamin supplements are the easiest way to give your body what it needs. You can use vitamins and supplements in your normal diet, although you’ll need to choose them accordingly with what you need and what your diet consists of. Even though there are many vitamins that you can benefit from, one of the most important is B12, which can raise your energy levels and help with your immune system. Some other vitamins you’ll need to include in your normal diet are vitamin A, C, D, and E. These vitamins are very important to your body, as they help with many different functions. Vitamins C and E are among the most important, as they help with your skin, hair growth, and the way your body functions. To ensure that your body remains at it’s best, you should make sure that you get the right amount of vitamins with your diet. You can find vitamin supplements locally or on the Internet, with hundreds to choose from. You should also include selenium and colostrum in your daily diet as well, as these two vitamins will help you with your health. If you take the right vitamins with your diet - you’ll find that your health and energy will always will remain at their top levels of performance. VITAMIN A Enhances immunity, prevents eye problems and skin disorders. Important in bone and teeth formation. Protects against colds and infection. Slows aging process. HERBAL SOURCES: Alfalfa, borage leaves, burdock root, cayenne, chickweed, eyebright, fennel seed, hops, horsetail, kelp, lemongrass, mullein, nettle, oat straw, paprika, parsley, peppermint, plantain, raspberry leaves, red clover, rose hips, sage, uva ursi, violet leaves, watercress, yellow dock. VITAMIN B1 (Thiamine) Promotes growth, improves mental attitude, aids digestion, helps strengthen nervous system and prevent stress. HERBAL SOURCES: Alfalfa, bladder wrack, burdock root, catnip, cayenne, chamomile, chickweed, eyebright, fennel seed, fenugreek, hops, nettle, oat straw, parsley, peppermint, raspberry leaves, red clover, rose hips, sage, yarrow, and yellow dock. VITAMIN B2 (Riboflavin) Needed for red blood cell formation, aids growth and reproduction, promotes hair, skin and nail growth. Important in the prevention and treatment of cataracts. HERBAL SOURCES: Alfalfa, bladder wrack, burdock root, catnip, cayenne, chamomile, chickweed, eyebright, fennel seed, fenugreek, ginseng, hops, horsetail, mullein, nettle, oat straw, parsley, peppermint, raspberry leaves, red clover, rose hips, sage, yellow dock. VITAMIN B3(Niacin) Essential for proper circulation and healthy skin. Increases energy, aids digestion, helps prevent migraines. HERBAL SOURCES: Alfalfa, burdock root, catnip, cayenne, chamomile, chickweed, eyebright, fennel seed, hops, licorice, mullein, nettle, oat straw, parsley, peppermint, raspberry leaf, red clover, rose hips, slippery elm, yellow dock. VITAMIN B5 (Panothenic Acid) Enhances stamina, prevents anemia, helps wounds heal, fights infection, strengthens immune system. HERBAL SOURCES: Alfalfa, burdock root, nettle, yellow dock. VITAMIN B6 (Pyridoxine) Needed to produce hydrochloric acid. Aids in absorption of fats, and protein. Mildly diuretic, helps prevent kidney stones. Helpful in treating allergies, arthritis, and asthma. HERBAL SOURCES: Alfalfa, catnip, oat straw. VITAMIN B12 (cyanocobalamin) Helps prevent anemia. Protects nervous system, improves concentration, aids digestion. HERBAL SOURCES: Alfalfa, bladder wrack, hops. VITAMIN C (ascorbic acid) Helps calcium and iron formation. Enhances immunity. Helps prevent cancer. Aids in production of anti-stress hormones. Antioxidant required for proper tissue growth and repair, and adrenal gland function. HERBAL SOURCES: Alfalfa, burdock root, cayenne, chickweed, eyebright, fennel seed, fenugreek, hops, horsetail, kelp, peppermint, mullein, nettle, oat straw, paprika, parsley, pine needle, plantain, raspberry leaf, red clover, rose hips, skullcap, violet leaves, yarrow, yellow dock. VITAMIN D Essential for calcium and phosphorous utilization. Prevents rickets. Needed for normal growth of bones and teeth. Helps regulate heartbeat. Prevents cancer and enhances immunity. Aids thyroid function and blood clotting. HERBAL SOURCES: Alfalfa, horsetail, nettle, parsley. VITAMIN E Antioxidant which helps prevent cancer and heart disease. Prevents cell damage. Reduces blood pressure and promotes healthy skin and hair. HERBAL SOURCES: Alfalfa, bladder wrack, dandelion, dong quai, flaxseed, nettle, oat straw, raspberry leaf, rose hips. VITAMIN K Promotes healthy liver function. Helps bone formation and repair. Increases longevity. HERBAL SOURCES: Alfalfa, green tea, kelp, nettle, oat straw, shepherds purse. What are some Natural Vitamin Sources? There are a lot of people who do not have enough natural vitamin sources in their diet and therefore suffer from a deficiency of one or more vitamins. Obviously, it is possible to buy vitamin supplements to help overcome any deficiencies but for the majority of people it should be possible for them to obtain the majority of their recommended daily allowance of vitamins from natural vitamin sources. The key to gaining the correct amount of vitamins from natural vitamin sources is to eat a healthy and balanced diet. There are certain diets, such as vegetarian, that provide a limited number of natural vitamin supplements and therefore a supplement may be necessary. Also, the intake required of these natural vitamin sources at certain periods may need to be increased and a supplement may be the best option. It is important to be aware of each of the different types of vitamins and their best natural vitamin sources so that a person can incorporate as many of these as possible into their regular diet. Water soluble vitamins cannot be stored in the body and need to be replenished on a daily basis so it is natural vitamin sources for these vitamins that are the most essential to know. Which are the Vitamins with Side Effects? All vitamins are generally beneficial to health. But there are kinds of vitamins that when administered in large doses will cause some side effects and even diseases. As a rule of thumb, both the deficiency and the excessive intake of vitamins are harmful. It is then important that only the right amount of these nutrients is administered to the body. Vitamin A is believed to be the most toxic vitamin of all, if consumed inappropriately. If more than 25,000 IU of Vitamin A is taken in a day, you will experience loss of appetite and visible reduction of weight. There would also be notable bone malformations, internal bleedings, spontaneous fractures, and even liver toxicities. Pregnant mothers who have too much Vitamin A in their system are likely to deliver their babies with a particular birth defect. The known side effect of too much Vitamin C would be gastrointestinal distress and diarrhea. Hyperacidity and other stomach-related problems are common too. Those who have history of having stones in their kidneys are advised to consult with a doctor before taking any Vitamin C.
Vitamin E, even with their good oxidation properties, has harmful side effects too. Anything higher than 1,000 milligrams of Vitamin E in the body will interfere with normal blood clotting. And if this much is taken on a daily basis, nausea, fatigue, muscle weakness, and diarrhea can be expected. Vitamin D has a potential to be as toxic as Vitamin A. The most damaging side effect it causes would be bone lesions. Those who have taken too much Vitamin D, even if it they did on at a single time would surely experience the toxicities associated with Vitamin D.
Vitamin B has different types. Of them all, Vitamin B-6 and Vitamin B-12 are the ones that may just have some prominent side effects. Vitamin B-6 is believed to cause reversible neuropathy if more than 500 milligrams are taken each day, for a prolonged period of time. Note that the RDA for this vitamin is only 2 milligrams per day. Vitamin B-12, on the other hand, is the vitamin that is known to trigger allergic reactions when taken in relatively high doses. Many people believe that eating a well balanced diet provides all the vitamins and minerals necessary for good health. In ideal circumstances, this is the case, but in reality there are many reasons why you may need vitamin supplements to cope with living in the twentieth century environment. Taking vitamins when required is a safe method of optimizing your dietary sources of nutrients, providing you follow the instructions on product labels. Even when your food intake is good, inefficient digestion can limit your body’s uptake of vitamins. Some common causes of inefficient digestion are not chewing well enough and eating too fast. Both of these result in larger than normal food particle size, too large to allow complete action of digestive enzymes. Many people with dentures are unable to chew as efficiently as those with a full set of original teeth. Habitual drinking of liquids that are too hot, or consuming an excess of irritants such as coffee, tea or pickles and spices can cause inflammation of the digestive linings, resulting in a drop in secretion of digestive fluids and poorer extraction of vitamins and minerals from food. Drinking too much alcohol is known to damage the liver and pancreas which are vital to digestion and metabolism. It can also damage the lining of the intestinal tract and adversely affect the absorption of nutrients, leading to sub-clinical malnutrition. Regular heavy use of alcohol increases the body’s need for the B-group vitamins, particularly thiamine, niacin, pyridoxine, folic acid and vitamins B12, A and C as well as the minerals zinc, magnesium and calcium. Alcohol affects availability, absorption and metabolism of nutrients. Smoking too much tobacco is also an irritant to the digestive tract and increases the metabolic requirements of Vitamin C, all else being equal, by at least 30mg per cigarette over and above the typical requirements of a non-smoker. Vitamin C which is normally present in such foods as paw paws, oranges and capsicums, oxidizes rapidly once these fruits are cut, juiced, cooked or stored in direct sunlight or near heat. Vitamin C is important to the immune function. Overuse of laxatives can result in poor absorption of vitamins and minerals from food, by hastening the intestinal transit time. Paraffin and other mineral oils increase losses of fat soluble vitamins A, E and K. Other laxatives used to excess can cause large losses of minerals such as potassium, sodium and magnesium. Bizarre diets that miss out on whole groups of foods can be seriously lacking in vitamins. Even the popular low fat diets, if taken to an extreme, can be deficient in vitamins A, D and E. Vegetarian diets, which can exclude meat and other animal sources, must be very skillfully planned to avoid vitamin B12 deficiency, which may lead to anemia. Lengthy cooking or reheating of meat and vegetables can oxidize and destroy heat susceptible vitamins such as the B-group, C and E. Boiling vegetables leaches the water soluble vitamins B-group and C as well as many minerals. Light steaming is preferable. 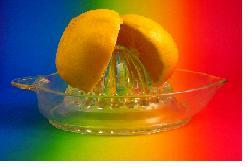 Some vitamins, such as vitamin B6 can be destroyed by irradiation from microwaves. Freezing food containing vitamin E can significantly reduce its levels once defrosted. Foods containing vitamin E exposed to heat and air can turn rancid. Many common sources of vitamin E, such as bread and oils are nowadays highly processed, so that the vitamin E content is significantly reduced or missing totally, which increases storage life but can lower nutrient levels. Vitamin E is an antioxidant which defensively inhibits oxidative damage to all tissues. Other vitamin losses from food processing include vitamin B1 and C.
A diet overly dependent on highly refined carbohydrates, such as sugar, white flour and white rice, places greater demand on additional sources of B-group vitamins to process these carbohydrates. An unbalanced diet contributes to such conditions as irritability, lethargy and sleep disorders. Some antibiotics although valuable in fighting infection, also kill off friendly bacteria in the gut, which would normally be producing B-group vitamins to be absorbed through the intestinal walls. Such deficiencies can result in a variety of nervous conditions, therefore it may be advisable to supplement with B-group vitamins when on a lengthy course of broad spectrum antibiotics. The omission of whole food groups from the diet, as in the case of individuals allergic to gluten or lactose, can mean the loss of significant dietary sources of nutrients such as thiamine, riboflavin or calcium. Some agricultural soils are deficient in trace elements. Decades of intensive agriculture can overwork and deplete soils, unless all the soil nutrients, including trace elements, are regularly replaced. This means that food crops can be depleted of nutrients due to poor soil management. In one U.S Government survey, levels of essential minerals in crops were found to have declined by up to 68 per cent over a four year period in the 1970’s. Burns lead to a loss of protein and essential trace nutrients such as vitamins and minerals. Surgery increases the need for zinc, vitamin E and other nutrients involved in the cellular repair mechanism. The repair of broken bones will be retarded by an inadequate supply of calcium and vitamin C and conversely enhanced by a full dietary supply. The challenge of infection places high demand on the nutritional resources of zinc, magnesium and vitamins B5, B6 and zinc. Chemical, physical and emotional stresses can increase the body’s requirements for vitamins B2, B5, B6 and C. Air pollution increases the requirements for vitamin E.
Research has demonstrated that up to 60 per cent of women suffering from symptoms of premenstrual tension, such as headaches, irritability, bloated ness, breast tenderness, lethargy and depression can benefit from supplementation with vitamin B6. Rapid growth spurts such as in the teenage years, particularly in girls, place high demands on nutritional resources to underwrite the accelerated physical, biochemical and emotional development in this age group. Data from the USA Ten State Nutrition Survey (in 1968-70 covering a total of 24,000 families and 86,000 individuals) showed that between 30-50 per cent of adolescents aged 12-16 had dietary intakes below two thirds of the recommended daily averages for Vitamin A, C, calcium and iron. Pregnancy creates higher than average demands for nutrients, to ensure healthy growth of the baby and comfortable confinement for the mother. Nutrients which typically require increase during pregnancy are the B-group, especially B1, B2, B3, B6, folic acid and B12, A, D, E and the minerals calcium, iron, magnesium, zinc and phosphorous. The Ten State Nutrition Survey in the USA in 1968-70 showed that as many as 80 per cent of the pregnant women surveyed had dietary intakes below two thirds of recommended daily allowances. Professional assessment of nutrient requirements during pregnancy should be sought. Oral Contraceptives can decrease absorption of folic acid and increase the need for vitamin B6, and possibly vitamin C, zinc and riboflavin. Approximately 22 per cent of Australian women aged 15-44 are believed to be on “the pill” at any one time. Some people eat very sparingly, even without weight reduction goals. US dietary surveys have shown that an average woman maintains her weight on 7560 kilojoules per day, at which level her diet is likely to be low in thiamine, calcium and iron. The aged have been shown to have a low intake of vitamins and minerals, particularly iron, calcium and zinc. Folic acid deficiency is often found, in conjunction with vitamin C deficiency. Fibre intake is often low. Riboflavin (B2) and pyridoxine (B6) deficiencies have also been observed. Possible causes include impaired sense of taste and smell, reduced secretion of digestive enzymes, chronic disease and, maybe, physical impairment. Invalids, shift workers and people whose exposure to sunlight may be minimal can suffer from insufficient amounts of vitamin D, which is required for calcium metabolism, without which rickets and osteoporosis (bone thinning) has been observed. Ultraviolet light is the stimulus to vitamin D formation in skin. It is blocked by cloud, fog, smog, smoke, ordinary window glass, curtains and clothing. The maximum recommended daily supplement intake of vitamin D is 400 i.u. Wide fluctuations in individual nutrient requirements from the official recommended average vitamin and mineral intakes are common, particularly for those in high physical demand vocations, such as athletics and manual labor, taking into account body weight and physical type. Protein intake influences the need for vitamin B6 and vitamin B1 is linked to kilo joule intake. Although the body is able to store reserves of certain vitamins such as A and E, Canadian autopsy data has shown that up to thirty percent of the population have reserves of vitamin A so low as to be judged “at risk”. Vitamin A is important to healthy skin and mucous membranes (including the sinus and lungs) and eyesight. Athletes consume large amounts of food and experience considerable stress. These factors affect their needs for B-group vitamins, vitamin C and iron in particular. Tests on Australian Olympic athletes and A-grade football players, for example, have shown wide ranging vitamin deficiencies. What is the Ginkgo Biloba Tree? What is the Biloba Ginkgo Vitamin? What is Maidenhair tree seed? SITE DISCLAIMER: Do these products “cure” anything? Of course not… but it stands to reason that if you cleanse your body and feed it the finest nutrition available, giving it everything it needs in balance, on a daily basis, that your body will do what nature intended, and give you the best possible chance to fend off sickness and disease. This vitamins information is not presented by a medical practitioner and is for educational and informational purposes only. The content is not intended to be a substitute for professional medical advice, diagnosis, or treatment. Always seek the advice of your physician or other qualified health provider with any vitamins questions you may have regarding a medical condition. Never disregard professional medical advice or delay in seeking it because of something you have read. The vitamins resources on this site are not intended to be a substitute for professional advice. While all attempts have been made to verify information provided in this publication, neither the author nor the publisher assumes any responsibility for errors, omissions or contrary interpretation of the web site vitamins subject matter herein. The site vitamins contents are solely the opinion of the authors and should not be considered as a form of advice, direction and/or recommendation of any kind. If expert advice or counseling is needed, services of a competent professional should be sought. The author and the Publisher assume no responsibility or liability and specifically disclaim any warranty, express or implied for any products or services mentioned, or any techniques or vitamins practices described. The purchaser or reader of this publication assumes responsibility for the use of these vitamins materials and information. Neither the author nor the Publisher assumes any responsibility or liability whatsoever on the behalf of any purchaser or reader of these vitamins materials. There is no guarantee of validity of accuracy. Any perceived slight of specific people or organizations is unintentional. This website and its creators are not responsible for the content of any sites linked to. Since natural and/or dietary supplements are not FDA approved they must be accompanied by a two-part disclaimer on the product label: that the statement has not been evaluated by FDA and that the product is not intended to "diagnose, treat, cure or prevent any disease."